Tasting through the 2015 as depicted by house Selbach-Oster can be a great many things, but most of all, it is great fun. Mosel Riesling is beautiful, moving, delicate. But it's also fun, joyful, vibrant, arguably the most delicious wine in the world. The quality among the top ten/twenty/forty/whatever producers is so high that I could probably load up on cases from any given producer in that rank. 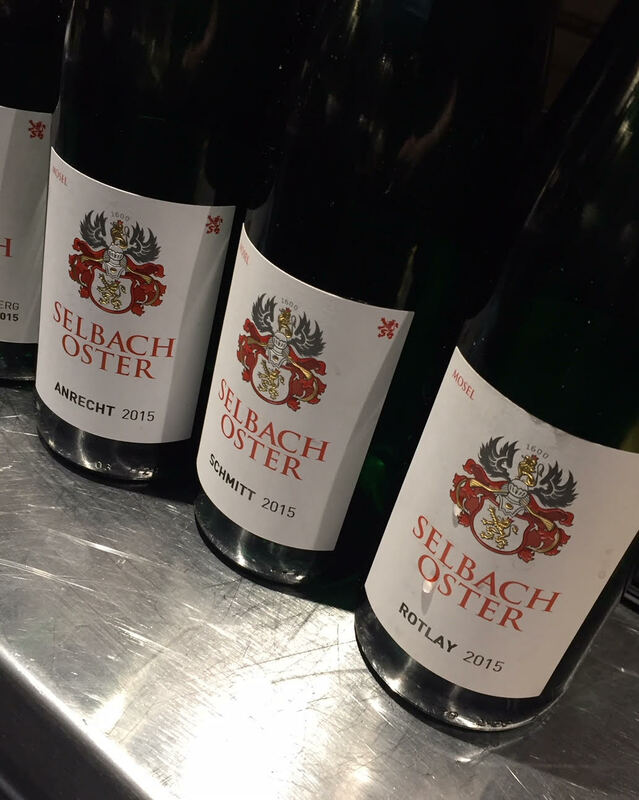 I could make a case, though, that the price point at Selbach is the best in the Mosel. White fruit, minerals, a very nice midweek or brunch drink, if you want some variety in your Riesling diet. The 2016 is apples and chalk with such intense acidity it comes off as dry and rough. The 2015 has much better balance, which allows the wine to show more fullness, depth and nuances. An outright dry wine, and even though I’m not a fan of the style in the Mosel, the nose is complex and interesting. However, while the palate is almost as focused as it is lean, in the end it’s too austere for me and not as successful as the 2012 was. A moving nose, deep, almost brooding, very complex. The palate is as complex, earthy, a little bitter, with the pungent bite of green apple and lime. Lighter than brother Domprobst, it doesn’t show the same bass notes of brooding melancholy. It's more restrained and the finish is cleaner, salty rather than bitter. This has been a fave year in and year out and tonight it’s the first wine to really make me grin. Finely balanced and wonderfully evocative, a classic Mosel with its apples, peaches and slate. A very classic Mosel, a very classic Spatlese, a sweet gossamer snowflake of apples, apricots and a touch of Atlantic salt. Addictive. Very young and very dense. If the Spatlese was a snowflake, then this is a snowball that will take decades to unwind - or rather melt, if I want to maintain my simile. The final three wines are what Johannes Selbach calls the "en bloc" series and are made from a single pass through specific parcels in their respective vineyards. The idea is to highlight the terroir and not necessarily the pradikat, despite the label. I assume the grapes were picked at a date that ensured the combined must weight of an Auslese. I'm less sure about the presence of botrytis; only the Rotlay exhibited any signs of that. Crystalline, regal and cool, a perfect balance of the sweet and the saline. This seems the most complete and complex of the three, deftly combining sweetness and laser-like focus. Tropical and and a bit unfocused, it seems like one of those Auslese that need 3-4 decades for the acidity to overcome the baby fat and sugar. A good way to sum up the tasting would be to recommend an optimal purchase strategy. A couple of Saar Kabinetts for immediate pleasure. A six pack of the Schlossberg Kabinetts to follow over two to eight years (who am I kidding, they'd all be drunk up within a year). One or two Sonnenuhr Ur Alter Reben. None of the other Spatlese or Ausleses are imported except for the "en block" wines, and here I'd pass up on the Rotlays and buy a bottle of the Anrecht and as many Schmitts as you can afford. The Schmitt is a treasure and a real keeper.